Cinematic trailer for Sayanti & Sanjay, as they got married on 19th Feb 2018. Cinematic Wedding trailer for Gaurav & Priyanka. Cinematic Trailer for Shweta & Amit as they got married on 18th Feb, 2018. PreWedding Shoot for Bhavin & Ankita as they get married on 12th March 2018. A story of a Telugu boy & a Odia Girl. Cinematic wedding trailer for Vivek & Susmita as they got married on 25th Nov 2017. Cinematic wedding teaser for Shriram Sultania & Natasha Todi as they got married on 3rd July 2017 at Siliguri, West Bengal.
" the day of her life "
Full cinematic wedding film by A Bridal Story.. Cinematography : Tanmoy Karmakar & team. 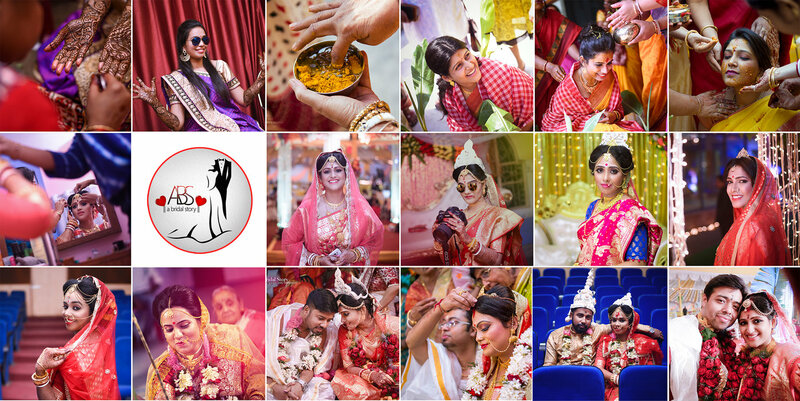 All right reserved || A Bridal Story || Subscribe our channels to get more updates.
" for her soulmate "
Telugu Wedding trailer for Sravani & Kishore, covering by A Bridal Story. Cinematographer : Subhottam Gangopadhyay Special Effects & Edit : Avishek Agarwal Music : Christina Perri - A Thousand Years Do watch - Like & Subscribe our channel.. Wedding Film for Breeti &Indranil. Wedding teaser for Madhuraa Bhattacharya & Souravh Mukherjee. Subscribe us for more updates. Bengali Wedding Teaser for Breeti Sarkar & Indranil Das. Please view it in HD mode. Bengali wedding teaser by A Bridal Story - Film. subscribe us to get further updates. We are three years old professional photography & cinematography services company, specializing in Indian Wedding, Bridal Portraits, Tamil Wedding, Pre-wedding Shoots, Hindu Wedding, Reception, Marwadi Wedding, Bengali Wedding, Engagement, South Indian Wedding, Candid Wedding, Wedding, Commercial and Product Shoot photography. We offer products and services such as CD / DVD, HD Videos and Photobook. We accept customized photography requirements. Our studio is in Kolkata. We are comfortable communicating in Bengali, Hindi and English. Your message was successfully sent to A Bridal Story. The Photographer may contact you soon.